Our indulgent, silky formula, blooms with a luxurious fragrance of moroccan argan & camellia oils, bringing to life our wholesome care that conditions & illuminates dull, dry hair. Rated 5 out of 5 by Blushing86 from Impressed I thought I was impressed because so many other products have failed but the first use I noticed a visually noticeable difference so I am giving 5 stars. This mask seems to improve on the shampoo and conditioner as expected and in some nice extras. I am more a fan of the fragrance of this mask. The other took some getting used to. Like te conditioner the tangles fall right out. That is important to me. Overnight tangles can form in this dry heat and winter air mix especially just wesring it out blowing in the wind all day. in the shower it feels like silk and seems like majic how the tangles just dissolve even more so than the conditioner. This mask is extremely thick and I am glad I read reviews before trying. I am heavy handed with products so I was raising an eyebrow at the tiny little package. My hair is extremely thick and just aboe my shoulders and az i dont care to section it can take a bit of product to really feel the product is integrated. This mask surprised me..it really got i. therr. I cut my package open prior to showering seeing how some had issues with wet hands in the shower and put just a little on my hand at a time. To my surprise I had product left which i NeVeR would have believed. i thought sure all the reviews that mentioned it had tiny little heads of very thin hair of a less dense and less curly texture. Already Ive notoced the drying time is cut and the curls are even happier. I feel like i finally found my products and hope this can be bottled up or sold in packs so that I can use it as my normal daily conditioner. As i think the mask is an amped up version of the conditioner that works how my hairs can actually handle on a regularly basis especially in the winter. Even less frizz. Even more defined. Even healthier looking. Less dull. More of that natural shine without having to use product that flattens the full natural fluff of curls that makes my hair. Rated 5 out of 5 by jle513 from Absolutely love! I wasn't expecting this type of product when I tried it! Most hair masks I've tried have been thin like normal conditioners. Not this! Whole Blends was thick and rich and so smooth. I loved the fragrance, as well. I could tell a difference in my hairs health as soon as I rinsed. After I dried, my straight hair was smooth and shiny, and had no fly aways. Rated 5 out of 5 by Hefaroni from Amazing Recovery for damaged hair I was very surprised and amazed by how much this conditioner revitalized my hair, bringing back a bounce and vibrancy to my usual fried limp hair. I will be honest and say I really didn't like the fragrance at all almost grannyish. Just like bad perfume from dollar store. But it definitely gave life back to my frizzy overprocessed hair. Rated 4 out of 5 by Karen10398 from Worked very nice. My hair is very dry. I have over processed hair, bleached and dyed a thousand times, so this product came just in time. I washed my hair opened up the little pouch of Garnier Whole Blends Argan Monodose Hair Mask, first off it smells so fruity and pretty. It is thick and coats your hair nicely. I stuck my hair in a shower cap and left it in for about 5 mins. After rinsing off, my hair already felt fresh and healthy. My hair feels and looks beautiful!!! 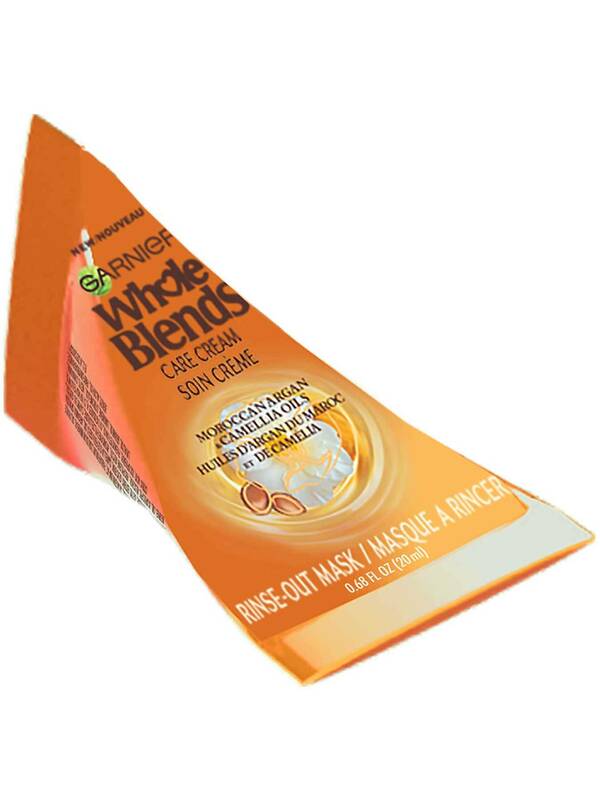 Rated 5 out of 5 by Taliamm from Garnier Whole Blends Hair Mask I love this mask!! I love the smell and how soft it leaves my hair. It doesnt weigh your hair down like some other mask. I will defiently will keep using this #WholeBlends argan monodose hair mask and would recommend to anyone wanting silky, soft and shinny hair. Rated 4 out of 5 by Aprilhendricks from Softer, soother hair. I tried #WholeBlends Argan Monodose Hair Mask for the first time & let me tell you, it left my hair really smooth & silky, (I have very curly hair) and it really helped with frizz. I thought the smell wasn't too strong, it was just a OK scent for me but not bad. The hair mask doesn't weigh your hair down like some do. I felt like the hair mask rinsed well and my hair was really soft & manageable. I will definitely be a regular user of this hair mask. Rated 5 out of 5 by berthuff08 from Whole blends hair mask I loved this mask!! It made my hair so soft and shiny! It smells amazing and I will definitely buy this to use on my families hair. 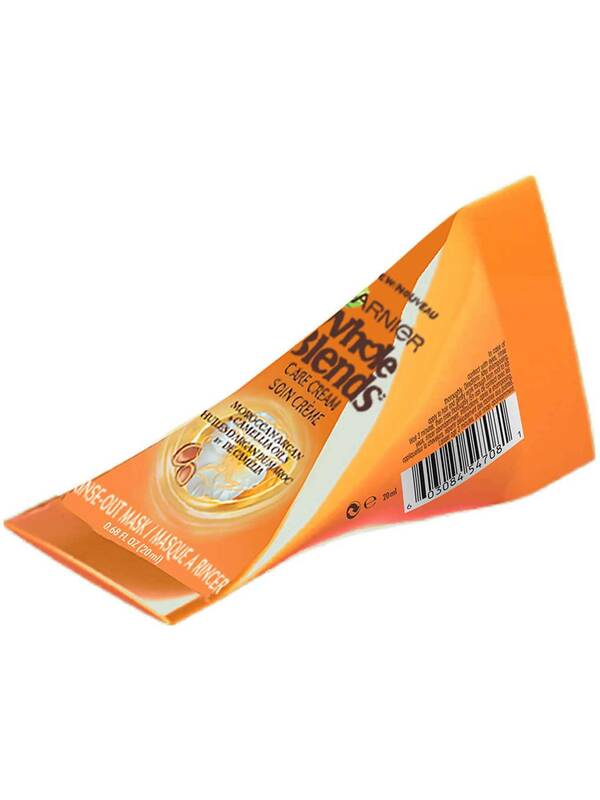 Rated 4 out of 5 by Jenmkonecny from Whole Blends The #wholeblends care cream left my hair feeling smooth and shiny. My hair is color treated every 2 months so it can get dried out, but this really left my hair feeling soft. I like that there is a lot in this small package. I had plenty to cover all of my long hair! It also smells really good and is easy to use.